We love it when our clients win an award. In fact we’ve blogged about how to win an inclusion award in the past. We are passionate about ensuring architects and developers are up-to-date on best practice in inclusive design and that can mean going above and beyond Part M, sometimes using BS8300 and adhering firmly to the principals of universal design. Sometimes through our Design Appraisal we will urge companies to go that extra mile, do something that will delight disabled people, their carers and families. For example we often urge architects to include a Changing Places facility in their designs and if it’s not possible to do it right away then we ask them to make sufficient provision through a flexible space for one to be installed in the future. 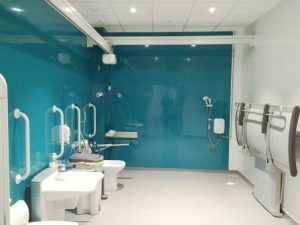 Such beneficial facilities are not currently in the building regulations but through experience we know they are life-changing for some disabled people who can venture out when they know of one being available. Changing Places toilets are different to standard accessible toilets as they have extra features and more space to meet the needs of people who use them. The short answer to “Oh do I HAVE to! ?” is probably “no you don’t” as there’s usually a loophole or a work around, but often doing so will significantly improve the quality of people’s lives (and go a long way towards meeting duties under the Equality Act). The extraordinary and recently deceased architect Zaha Hadid once said “There are 360 degrees, so why stick to one?” Let’s pause for a moment and consider what kind of dull world we would live in if all we did was work to the lowest common denominator? If you would like to find out more about a Design Review, Changing Places or would like some help to review accessibility at your business, then Proudlock Associates can assist you. Please contact us today and one of our friendly, expert team will be happy to help and answer any questions. We’re on 0845 130 1669.